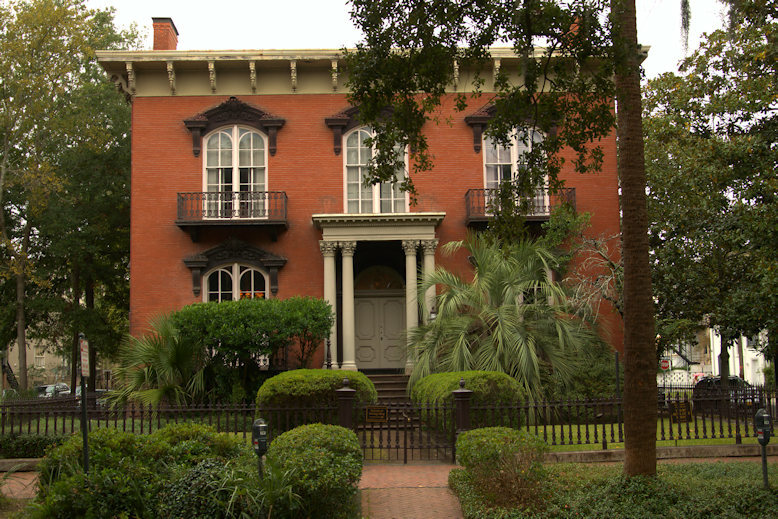 Due to the success of John Berendt’s Midnight in the Garden of Good and Evil, the book Savannah loves to hate, the Mercer House is perhaps the most famous in town. T0day, it’s officially the Mercer-Williams House Museum. [I added the hyphen; I don’t know why they don’t use one]. It is owned by the sister of Jim Williams, the antiques dealer who shot and killed one of his lovers, a hustler named Danny Hansford, in the house. Everyone knows the story. Wiliams’s eclectic collections are highlighted throughout. The house was designed by John Norris [architect of the Savannah Custom House and the Andrew Low House, among many others] for General Hugh Mercer, great-grandfather of Johnny Mercer, though the general nor the songwriter ever lived here. Construction began in 1860 but was interrupted by the Civil War. It was completed about 1868 by its new owner, John Wilder. In the 20th century it was used for a time as the Savannah Shriners Alee Temple and was purchased and restored by Jim Williams in 1969. Two other tragic deaths are associated with the Mercer House. An owner tripped over a banister and eventually died from a concussion in 1913 and a boy chasing pigeons on the roof fell off and impaled himself on one of the iron fence posts in 1969.